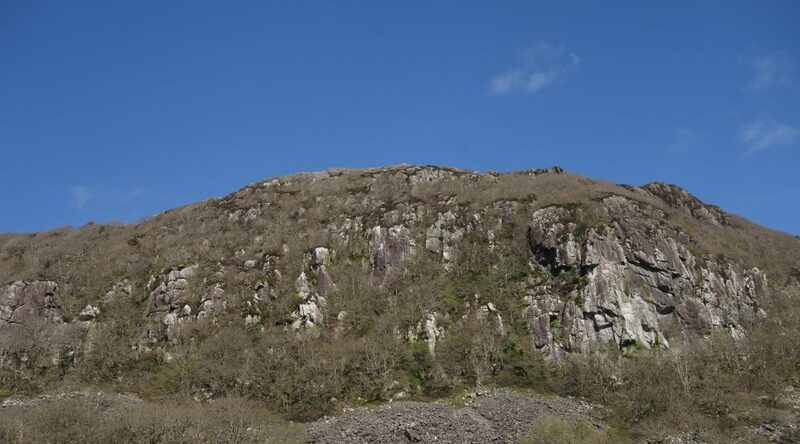 Craig Y Castell is found at the left end of the Tremadog Escarpment, just above the Tremadog Village school and a new local hospital. The climbing here is excellent, although not as extensive as other areas. Avoid the temptation to go in a straight line from the style and approach as for the Main area of Craig Y Castell and from the bottom of the scree then head up the left side until you find a feint path lead up left towards the crag. Follow this past Pert, Lonely Edge and on to Creigiau Cra’r Neidr. A great hidden gem with really good friction. A place to allow you to see what tremadog was like before it was popular. Gestiana E1 5b ** – Start below the hanging arete, Climb the slab heading right below the overlap to gain a corner groove. Follow this to another overlap and move over this on a delicate spike. Carry on to a roof and move right to the top of a block. Another overlap is passed with the assistance of some undercuts which leads to a jug. Climb the crack to easier ground and the top. Brass HVS 5a * – The central groove is rather overgrown and the gear is not great. Could be easily cleaned on abseil from one of the other routes. Cheap Trick E3 5b * – Start below a tree and a large roof. Move ups rock to the tree and pass over the vegetation to gain rock again below the roof. Hard to arrange gear here and a stiff pull gains the wall above. Continue up more or less direct past a overlap and then trend slight right to finish up just left of Cawod. Cawod HVS 5a ** – A great route, start by heading up the obvious V-Groove to a ledge. Move over the bulge to a wall, shimmy left and make a long balance reach for a slot. Head up the blunt rib and continue more or less directly up the slab. Keeping the obvious deep corner of Blas Y Cynfyd to your right. At a quartz band near the top either move right or left into a groove. Moving left leads straight to the abseil point. Blas Y Cynfyd HVS 5a ** – Another fine outing, start just right of Cawod at a short wall that is left of a blunt white rib. Climb the wall more or less direct. A bold pull out right over a small overlap provides entertainment. At a break move left to gain the start of a slab ramp that in turn becomes the fine corner at the top. Follow this to the top. About 20 metre to the right of Creigiau Cra’r Neidr in a smaller buttress. A good feature to head for is the tree trunk growing out horizontally at its base. Lonely Edge E2 5c ** – A fine outing starting from the lowest point on the arete and then more or less following the broken edge to the top. Start up the arete to a spike and peg on right. A tricky move past here leads to easier climbing up to a roof. Pass this on the right before heading back left to ledges. Move up to where there is a heart in your mouth move to regain the right arete. The Arete provides further excitement all the way to the top. A mind-blowing top pitch makes this route worthwhile hunting out.